1. The claim is to be dismissed. 2. By way of a counterclaim, European patent 1 234 567 B1 is to be revoked with effect for Switzerland and as a unitary patent. 3. All costs and damages, including patent attorney's costs, are to be borne by the claimant. The statement of claim gives only an incomplete account of the construction of the defendant's device and in particular of the filter array on its underside. Hence this defence is filed together with a series of photographs showing the construction of the relevant components in full. The photos show that the filter array comprises two lateral filter plates F1, F2 and a lower filter unit F3. The latter is arranged between a lower mask plate P1 and an upper mask plate P2. As is already clear from point 23 of the statement of claim at the end of II.D.2, lateral filter plates F1 and F2, as seen by a person standing in front of the device (i.e. on the user's side of the device), are arranged to the left and right of the suction motor, with filter unit F3 below. In front of and behind the suction motor there are no filter plates or noise insulation elements, only the metal plates of the housing. The following three cross-section drawings schematically illustrate the construction of the device, the sections through filter plates/elements F1, F2 and F3 being coloured red. Evidently – and as indicated by the arrows on the above drawings – air flow in the region of the lower filter array is such that the air first flows from below into one of the chambers that are open at the bottom, then horizontally through the filter plates of lower filter array F3 and finally exits at the top through one of the chambers open at the top. This increases the active filtering surface in the lower region of filter array F3 (compared with a simple horizontally arranged filter plate). Mask plates P1 and P2 are metal plates without any additional noise insulation. Hence in the region of the nine chambers the suction motor is acoustically shielded at the bottom not by filters but only by thin metal plates. Furthermore, the Premium range is also sold in a long model, in which three of the lower filter arrays stand on one another, such that the nine chambers are three times the normal height, thereby further increasing the filtering surface. A patent consists of a definition of the invention (patent claims) and explanatory text (description and drawings). The claims define the technical scope of the patent. The description and drawings may explain the meaning of the claims. For patent interpretation what matters is how a skilled person understands the claims in the light of the description and the drawings and of his common general knowledge. Interpretation of the scope of the patent must take account of the problem and the solution. In feature analysis, the individual features must be assigned their essential objective meaning. The patent proprietor bears the risk in case of incomplete, incorrect or contradictory definitions. The patent in suit concerns a ventilator device and the arrangement of components therein. It assumes that ventilator devices in the form of extractor hoods are known prior art. Such hoods possess a suction filter unit equipped with replaceable or washable filters. The suction motor fixed above the suction filter unit "makes a considerable amount of noise" (paragraph  of the patent in suit). 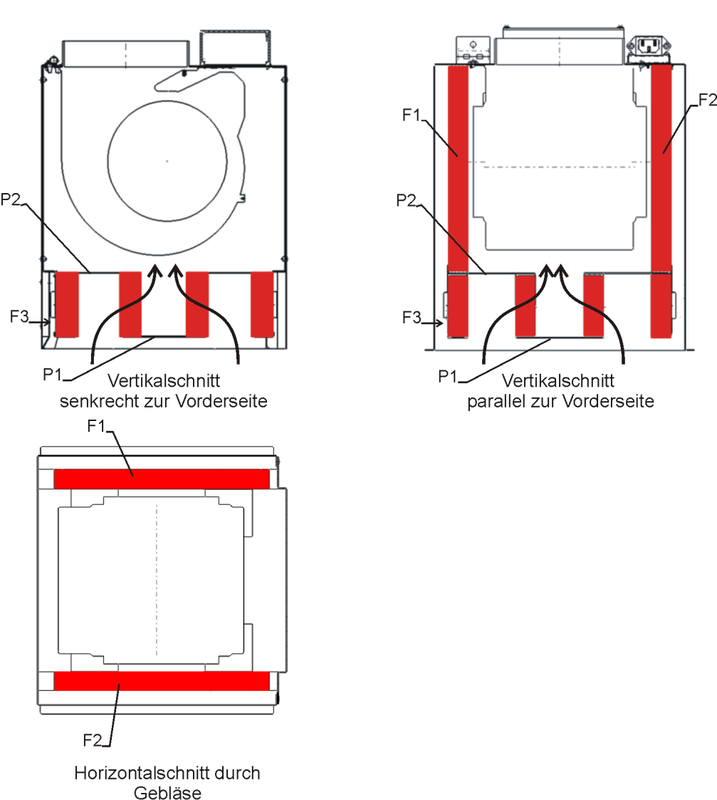 According to paragraph  of the patent in suit, the invention addresses the problem of creating a simple ventilator device that allows for efficient ventilation of a space with considerably less nuisance from noise. 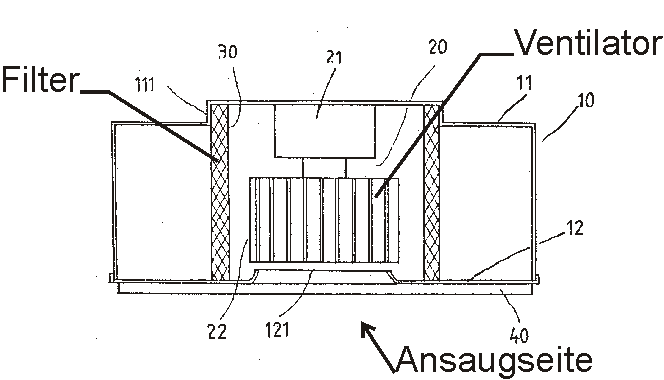 Paragraph  of the patent in suit assesses the claim solution, stating that if as per the invention the suction motor and the suction chamber "are enclosed by an absorption filter performing an air-purifying function and a noise insulation function, the air can be effectively extracted from a space without making a troublesome noise and purified deodorised air is passed into the exhaust path." 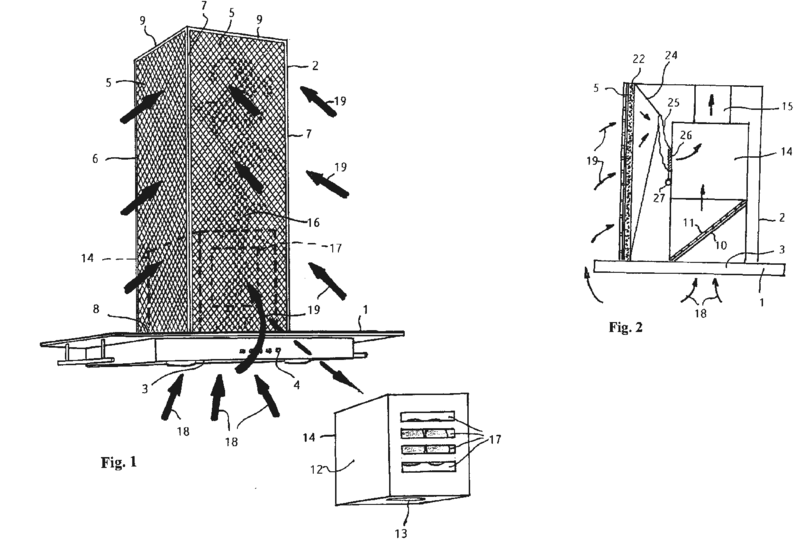 According to the embodiment in paragraph  of the patent in suit, the problem of the invention is solved if noise insulation reaches such a level that "a person standing next to the extractor hood hardly hears a running suction motor." The person skilled in this art is an engineer with experience in the field of ventilator devices. K3 and on the other hand a noise insulation function. According to the patent in suit the term "ventilator device" is to be construed broadly and in particular is not restricted to extractor or recirculation hoods – the claimed devices can also be used as cleaning modules for other appliances (paragraph  of the patent in suit). In the typical embodiment in the specification of the patent in suit, the term "inlet side" refers to the underside of the device. Thus it evidently means the area below the suction motor through which air is drawn into the device. The term "suction chamber" is not precisely defined in the patent in suit. From the combination of features O3 and O4 it follows that it must be the space in which the suction motor is housed. From the term "suction chamber" the skilled person also infers that this chamber must be on the suction side of the suction motor, so that air is sucked into the chamber. The term "suction motor" is likewise not precisely defined in the patent in suit; but it evidently means the motor by which air is sucked in, i.e. the motor of the fan. The "exhaust path" is evidently a part of the device which somehow vents exhaust air to the environment. 3.7 K1a, K1b: "the suction motor [...] by an absorption filter"
(a) Do K1a and K1b require the absorption filter to be located in the suction chamber? 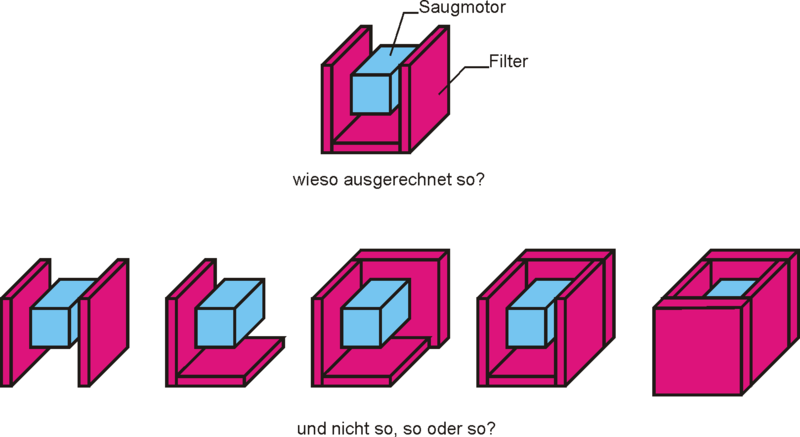 (b) How is "enclosed on the suction side" [saugseitig umgeben] to be understood? Do K1a and K1b require the absorption filter to be located in the suction chamber? "that the suction motor is enclosed on the suction side in the suction chamber by an absorption filter"
Both formulations, henceforth referred to as "sense 1" and "sense 2", when formulated as subordinate clauses in German would be covered by the formulation of feature K1. In sense 1 the feature means that the suction motor is housed in the suction chamber, but it leaves open whether the absorption filter too is housed in the suction chamber. In sense 2 the feature means that the absorption filter too is housed in the suction chamber. This grammatical ambiguity is illustrated very nicely by the English and French translations of the claims. The English formulation ("the suction motor is enclosed [....] in the suction chamber by an absorption filter") reflects sense 2, while the French translator has opted for sense 1 ("le moteur d'aspiration dans la chambre d'aspiration est entourné [....] d'un filtre de sorption"). The claimant assumes sense 2 is meant. As set out below, that is incorrect, and it causes the claimant to wrongly assess novelty and inventive step issues. The feature is to be interpreted in the light of the description and drawings of the patent in suit, seen from the skilled person's perspective (see point 40). In paragraph , as in the claim, the feature is formulated as a subordinate clause and is therefore ambiguous in purely linguistic terms. The skilled person cannot derive anything from this. In paragraph  too the German formulation is ambiguous in purely linguistic terms, and again is of no help to the skilled person. In Fig. 1, reference number 6, used in the description to reference the suction chamber, points to the space delimited by the filter cassettes 10-12. 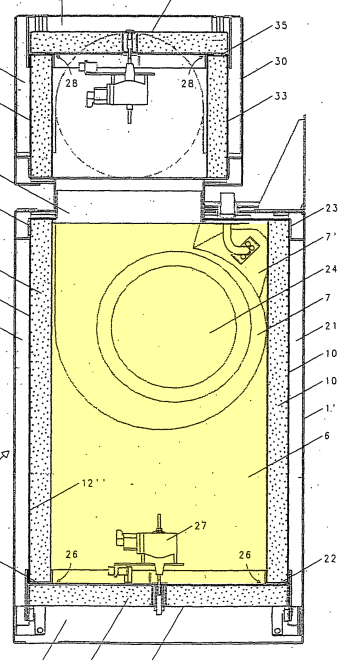 This suggests to the skilled person that the suction chamber is formed by this space, marked yellow in the figure below. 5. 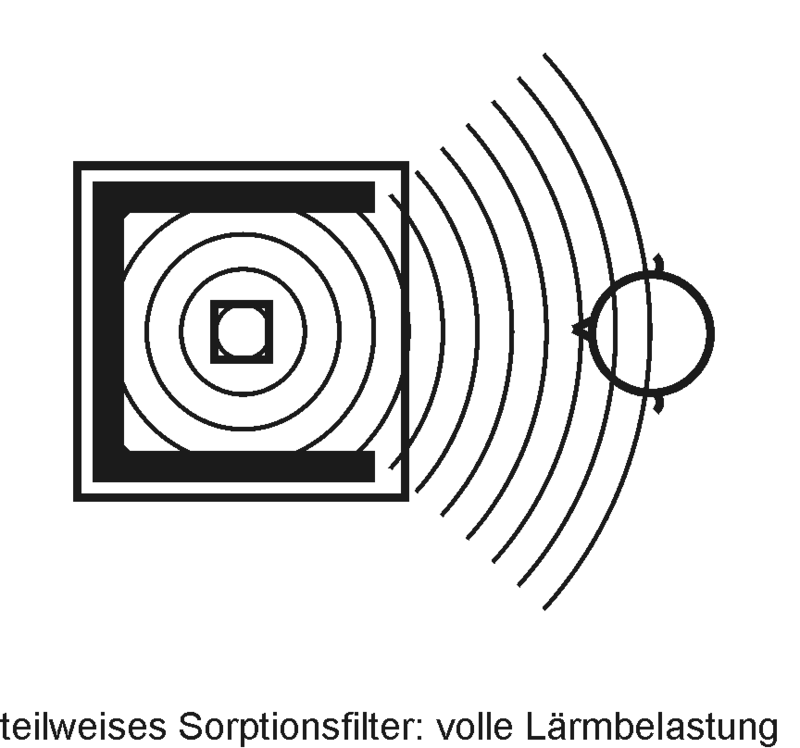 The ventilator device according to any of claims 1 to 4, characterised in that the primary air sucked via the filters of the inlet side (2) from a space into the suction chamber (6) (die über die Filter ... in die Saugkammer (6) angesaugte Primärluft), conveyed via the suction filter into the exhaust path (9), can be conveyed back from the exhaust path (9) into the space. The formulation "primary air sucked via the filters […] into the suction chamber" makes it entirely clear that the air flows into the suction chamber via the filters, which necessarily means that the filters in the embodiment of claim 5 are located outside the suction chamber. The above sense 2 of features K1a and K1b, whereby the filter is located in the suction chamber, would be incompatible with claim 5. From this the skilled person would clearly conclude that sense 2 is to be rejected and that features K1a and K1b leave it open whether the absorption filter is inside or outside the suction space. Ultimately it is the patent proprietor who bears the risk of an incorrect, incomplete or contradictory definition of the invention. In terms of the present case that means that the unclear formulation of features K1a and K1b cannot be construed to the proprietor's advantage. In other words, for purposes of novelty and inventive step the proprietor cannot rely on the narrow interpretation of the feature. To sum up: features K1a and K1b leave it open whether the absorption filter is located inside or outside the suction chamber. How is "enclosed on the suction side" [saugseitig umgeben] to be understood? Interpretation of the term "enclosed" in feature K1b is important in relation to infringement. This feature too is to be construed in the light of the description and drawings and from the skilled person's perspective. According to paragraph  the claimed ventilator device solves the problem of allowing for efficient ventilation in a room with considerably less nuisance from noise, and paragraph  goes into more detail: "If as per the invention the suction motor is enclosed in the suction chamber by an absorption filter performing an air-purifying function and a noise insulation function, the air can be effectively extracted without making a troublesome noise and purified deodorised air is passed into the exhaust path." This shows that a listener, at least one standing on the side without a filter, is met by the same sound wave as if there were no absorption filters at all. Thus as far as the listener is concerned there is no noise reduction. For someone standing in front of the device there is no noise protection at all. In column 1, lines 27-31, the patent in suit mentions precisely this situation as a disadvantage of the prior art. Hence especially if the filter is missing on the side where the user normally stands, i.e. in front of the device, in normal use there will be practically no noise reduction, especially as the housing is just as little soundproof as in the prior-art solutions. These considerations from the skilled person's perspective also reflect day-to-day experience of life. If Mum is reading the paper in the lounge and her son is listening to music in the next room, the connecting door only has to be a little way open for the music to disturb Mum in her reading. Completely shutting the door drastically reduces the noise level. So to insulate a noise source from the outside, it has to be insulated from the outside on all sides and over the entire area. Thus it is clear to the skilled person and the layman alike that there is a very great difference - and not just in degree - between a solution entirely closed on the suction side and one in which only one side (lateral or below) is at least partly open. In the first case practically no sound comes out on the suction side, so the effect according to paragraph  of the patent in suit is achieved ("without making a troublesome noise"). In the second case a considerable amount of sound comes out, and the situation described in paragraph  may arise (no noise protection for an operator standing next to or underneath the ventilator), which the patent in suit regards as the state of the art. To solve the problem according to paragraph  of the patent in suit and provide for extraction "without making a troublesome noise" according to paragraph , the term "enclosed on the suction side" can only be construed as meaning that on the suction side the suction chamber must be enclosed by the absorption filter on all sides. If just one side, especially a side facing the living space, is partially or completely open, the whole mechanism loses its noise-protecting effect almost entirely, such that the problem is no longer solved. In interpreting a patent's scope of protection, particular attention is to be paid to solving the problem underlying the invention (see above, point 35). "The individual cassettes 10, 11, 12 are each held in guide rails 22, 23 within the housing 1' such that they form a box and so form a closed space enclosing the suction motor, thereby fulfilling the desired noise-insulation function, with the result that a person standing next to the extractor hood hardly hears a running suction motor" (emphasis added). The term "desired noise-insulation function" can only mean the function according to paragraph  of the patent in suit, and the words "hardly hears" refer to paragraph , about not making a troublesome noise. The patent in suit does not provide any teaching on solving the problem and suppressing troublesome noise other than the "closed space" according to paragraph . To sum up: feature K1b is to be construed as meaning that on the suction side the suction motor is enclosed by the absorption filter on all sides. Feature K2 assigns the absorption filter an air-purifying function. This parameter is not quantified. Feature K3 assigns the absorption filter a noise insulation function. This parameter is likewise not quantified in the claims of the patent in suit. In fact, every absorption filter to some extent has noise insulation properties. Yet we could also take the stance that not every minor noise insulation is capable of solving the problem underlying the invention. According to paragraph  of the patent in suit, noise insulation must make possible "considerably less nuisance from noise". It is also apparent from paragraph  that the patent in suit specifically seeks to solve the problem of noise insulation. The desired noise insulation function would be fulfilled (only) if, thanks to the filter, air can be extracted "without making a troublesome noise." That would imply practically 100% noise insulation by the absorption filter. But if the claimant were to take the view that even partial sound absorption is sufficient as a "noise insulation function", the patent in suit can only be construed as meaning that any absorption filter, however thin, performs this function, as it contains no indication of qualitative or quantitative interpretation anywhere between these extremes. The claimant's interpretation as per D.2 of the statement of claim is disputed. The claimant seems to read feature K1b as saying that it suffices that on the suction side the absorption filter is arranged around the suction motor in the form of a semi-circle or a U. Yet the claimant does not say how the noise insulation function inherent in the patent in suit is to be fulfilled in such a construction, although it bears the burden of proof for that and must at least make it credible. In points 63-77 above it was substantiated in detail that feature K1b cannot be construed as meaning other than that on the suction side the suction motor must be enclosed by an absorption filter on all sides in order to solve the problem underlying the patent in suit. It is unclear how the claimant arrives at the idea that to solve this problem it suffices – according to its Request No. 1 – for filters to be arranged beneath the ventilator and on at least two further opposing sides. The patent specification at any rate gives no indication that it is precisely this U-shaped configuration that reflects the term "enclosed on the suction side" according to claim 1 of the patent in suit and hence also the definition of the underlying problem. This choice by the claimant seems entirely arbitrary. Why is it not sufficient for there to be two absorption filter plates together forming an L-shape (which after all is equivalent to a 180° semi-circle), or two filter plates with the motor mounted between them? Why doesn't there have to be enclosure on at least four sides, or at least five sides? Or on three adjacent sides? The claimant argues that not all sides need to be covered by absorption filters; but it can equally well be further argued that it suffices for certain sides to be only partially covered by absorption filters. The patent specification gives the skilled person no incentive to opt specifically for the semi-circle or for three filter plates arranged in a U-shape (which then have to cover the three sides 100%) as the interpretation of feature K1b. In connection with the interpretation of the term "enclosed on the suction side", too, it must be borne in mind that the patent proprietor bears the risk for incomplete definitions of a patent claim. Moreover, interpretation must be based on the objective understanding of the skilled person. The claimant's interpretation that a U-shaped configuration is also covered by the patent in suit's scope of protection is however clearly based on purely subjective – and hence untenable – criteria. To sum up: feature K1b as objectively understood by the skilled person can only be construed as meaning that a U-shaped configuration of the active charcoal filters is not capable of solving the problem underlying the patent in suit. Otherwise the patent would have to be construed so broadly that it embraces solutions with two, three or four differently arranged filter plates. Similarly, feature K1b would then also have to embrace solutions in which the filter plates do not extend over the entire lateral surfaces. As user disturbance through suction noise can be significantly reduced only if the suction motor at least on the suction side is shielded by the absorption filter on all sides, it is clear that the claimant's U-shaped configuration, which e.g. (as in the defendant's Premium device) does not shield the motor towards the front (i.e. in the most relevant direction for the user), does not solve the problem (paragraph ) or have the effect (paragraph ) underlying the patent in suit. The key to interpretation is the understanding of the skilled person, who would have understood from the patent specification that the claimed enclosure of the suction motor has the purpose of preventing the generation of troublesome noise (paragraph  of the patent in suit). In contrast, the claimant's considerations do not in any way address the question of what noise-insulating effect is achieved with different configurations of the absorption filter. The patent in suit in fact gives no indication that "surrounded" could be construed more broadly than shown in the sample embodiment. The claimant further maintains that it can be inferred from claim 3 of the patent in suit that "enclosed" in claim 1 cannot be interpreted as "surrounded" because a gradation in the scope of protection is defined in the sense that "enclosed" in claim 1 defines the scope of protection more broadly and protection is not confined to "surrounded". 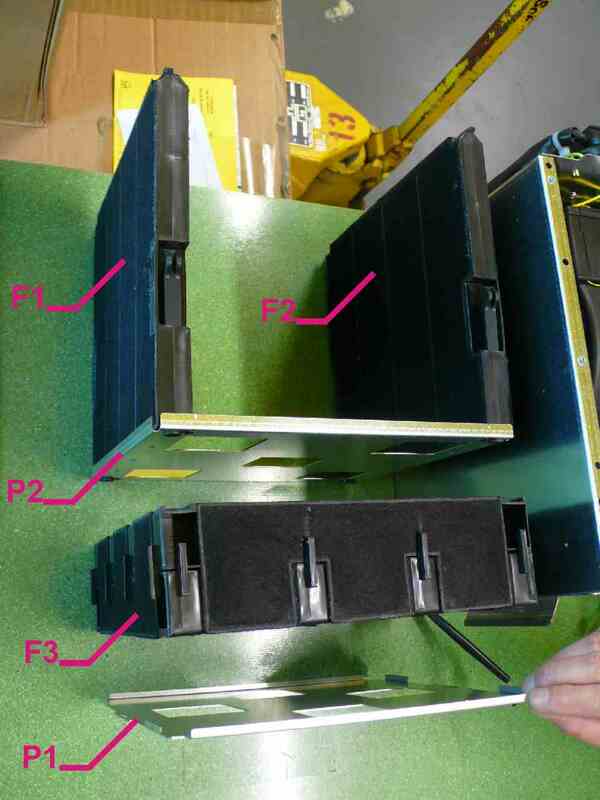 But on a closer view it must be found that the gradation defined by claim 3 takes the form of the cassettes being held in guide rails such that they form a box. Thus claim 3 concerns the idea of forming a box from planar cassettes (claim 2) held in guide rails. Hence the claim describes the structure (planar cassettes) and mounting (guide rails) of the absorption filter mentioned in claim 1 and its box shape (e.g. as distinct from a cylindrical shape). The only thing the skilled person can infer from this with regard to the term "enclosed" in claim 1 is that the defendant's interpretation is compatible with claim 3. Furthermore, it is also not the case that in mounting an extractor hood on the wall it would be obvious to dispense with the wall-side absorption filter. Doing so would mean dispensing with the chamber at the rear according to reference number 21 of Fig. 1 of the patent in suit. As shown below, the contested embodiment does not include all the features of claim 1 of the patent in suit. As argued, feature K1b is to be construed as meaning that on the suction side the suction motor is enclosed by an absorption filter on all sides. As the claimant rightly argues, and as described and illustrated in section I above, to the left and right of the motor and the ventilator (viewing the defendant's Premium device from the front as in illustration 1 of the statement of claim) there is one active charcoal filter per side. By contrast, in the contested embodiment at the front and back there are no active charcoal filters, indeed no filters at all. In fact in the contested embodiment the suction chamber is confined the front and back merely by metal plates. In the defendant's device, towards the back and towards the front, i.e. the normal operating side, there are no noise-insulating filters or other materials. Hence the noise issues from the suction chamber and comes straight at the user. (That the defendant's device is nevertheless not particularly loud is due to other measures, in particular the use of a quiet suction motor.) Thus the defendant's setup does not solve the problem underlying the invention claimed by the claimant, which simply implies that the contested embodiment does not include all the features of claim 1 of the patent in suit. Yet even following the claimant's interpretation and assuming that feature K1b is fulfilled even if the absorption filter encloses the suction motor on the suction side in such a way that it forms a semi-circle or U around the suction motor, feature K1b is not used, as there is no continuous horizontal filter plate beneath the suction motor. As explained above, beneath the suction motor there are a total of eight vertically standing filter plates arranged between mask plates P1 and P2. The figures below, by way of a vertical section through the device (section plane perpendicular to device front through device centre), show suction noise propagation (or noise insulation by the filter) with the defendant's device (left) and with the device according to the patent in suit (right). Note that the user's indicated position in front of the device is where the user will mostly be standing, as it is the front of the hob and the operating side for the extractor hood. The same reservations apply, i.e. reflection and diffraction effects in particular are not taken into account in the above drawings. If they were, the passage of sound through the lower filter array would be far greater than shown, as diffraction and reflection would cause noise to issue in directions in which it is shielded in the illustrations. Moreover, reflected sound in the living space would mean that the noise could be heard everywhere. Thus it is clear that the defendant's devices are far from achieving the effect achieved by the device according to the (correctly interpreted) claim, and this is not just a difference of degree, but a fundamental difference in that in the device according to the patent in suit (as per its paragraph ) the air can be extracted "without making a troublesome noise" (i.e. noise propagation is in essence completely avoided), whereas in the defendant's device there is no noise protection for a person standing in front of the device (as per the prior art discussed in paragraph  of the patent in suit). Thus there is neither literal infringement nor imitation. Feature K1b is not used and the effect sought thereby is not achieved. As set out below, the patent in suit is to be revoked for lack of novelty, lack of inventive step and unallowable amendment during the grant proceedings. The ventilator device according to claim 1 (and 2) of the patent in suit is anticipated, or at least made obvious, by EP 1 134 501 (EP '501). EP '501 in Fig. 1 shows an extractor hood with a chimney 2, in which there is a housing 12 accommodating the suction motor (see Fig. 1). The housing 12 is arranged in the chimney 2 (see Fig. 1). On the vertical outer side of the chimney 2 panels 5 are mounted, at least some of which are mesh panels (column 5, line 1). Behind the mesh panels 5 there are planar filter cassettes 22 (paragraph  of EP '501 and column 5, lines 42, 43), which may among other things be charcoal filters (column 5, line 54). A further charcoal filter 11 is positioned below the housing 12 (Fig. 12, column 5, line 8). Note that the dome 24 and tube 25 shown in Fig. 2 of EP '501 are optional and that the inlet openings 17 (Fig. 1) of the housing 12 may also open directly into the open interior of the chimney (see column 1, lines 48-51, according to which the inlet opening (17) can communicate with the open interior of the chimney; claim 3). An extractor hood (paragraph  EP '501) is a ventilator device, see also paragraph  of the patent in suit. Air is drawn into the chimney from below and through the outer side. The suction chamber can be either the housing 12 or the space enclosed by the side walls of the chimney, as air is drawn into both chambers thus defined. The suction motor visible through the slit 17 in Fig. 1 EP '501 is housed in the above suction chamber. The charcoal filters (column 5, line 8, and 54 EP '501) as absorption filters have an air-purifying function. The noise insulation function too is implicitly present for charcoal filters (see interpretation K3, point 79 above). Correctly interpreted, K1a and K1b of the patent in suit (claim 1) mean that the suction motor is housed in the suction chamber, while the absorption filter can also be located outside the suction chamber. If the housing 12 in EP '501 is regarded as a suction chamber, the absorption filters are outside the suction chamber and therefore, in the defendant's interpretation, features K1a and K1b of the patent in suit are fulfilled in that respect, as features K1a and K1b say nothing about whether the absorption filter is located inside or outside the suction space (see above). In the device according to EP '501, however, the space enclosed by the side walls of the chimney may also be regarded as a suction chamber, as the air is drawn into that space, which means that features K1a and K1b are fulfilled in that respect even according to the claimant's interpretation. Correctly interpreted, K1b of the patent in suit (claim 1) further means that on the suction side the suction motor is surrounded on all sides by the absorption filter (above). The claimant though seems to assume that it is sufficient if the suction motor is located within a U-shaped configuration of suction filters. It is evident from Fig. 1 of EP '501 that mesh panels 5 are arranged at least on three sides of the chimney (two are directly visible, a third is disclosed by the three air flow arrows 19 on the right), and according to column 5, lines 41-43, behind the mesh panels 5 there are matching filter cassettes 22. This alone implies that these filter cassettes are in a U-shaped configuration, meaning that the suction motor lies within this configuration. Air is drawn in through these filters (arrows 19 in Fig. 1). Thus on the suction side the suction motor lies within this U shape formed by the filter plates. For that very reason, feature K1b is anticipated by claim 1 of the patent in suit in the claimant's interpretation. Furthermore, there is also a charcoal filter 11 positioned beneath the suction motor (Fig. 2). Further, Figures 15-18 show various embodiments of the filters in the chimney walls, with Fig. 18 even showing an embodiment in which filters are arranged on all four chimney walls. To obtain a maximum filtering surface in a free-standing device it would be obvious for the skilled person to combine the teaching of Fig. 18 with the embodiment of Fig. 1 in order to arrive at a device in which the suction motor is enclosed by filter plates on all four vertical sides and which in addition possesses a filter plate 11 beneath the suction motor. Thus EP '501 at least makes claims 1 and 2 obvious, even in the claimant's interpretation of K1b.